Today's random set is 3742 Tender, released in 2001. It's one of 16 Trains sets produced that year. It contains 39 pieces, and its retail price was US$11/£6.99. It's owned by 645 Brickset members. If you want to add it to your collection you might find it for sale at BrickLink or eBay. Intersting set.................................But, I think it's a BIT out of place. Shouldn't it be included with other train cars? I know that Lego wanted more money by separating the chunks into individual sets, but I still say it's a bit out of place. Well, what can I say? I think this is just another one of those random themes Lego felt like making one morning when they were bored. I've never been a big train fan, but looking in the [email protected] Magazine at all the different cars you could buy to make your own custom train made me really want to get a train. The only thing that stopped me were my cats that were still in their chew-all-the-LEGO phase... not to mention I was too young to have the funds as I was a kid. I know! When I saw this come up as the set of the day I was like - Woah...That train car looks pretty lonely all by itself! I believe this set was a part of the "Build Your Own Train" line, and so you could purchase different cars, sometimes in different colors. I agree with many users above. Individual train cars are great, but a lone tender is just odd with no locomotive. ^^It's tagged "my own train". I guess the idea was that you could get one tender and use it with either the small or large locomotive. I got the small locomotive and at least one of all of the My Own Train cars back when they came out, but I never bothered to pick up the tender. Seeing it sitting there on its own always seemed weird, and I didn't really feel a need for it. For those not sure about the lone tender, keep in mind that it is/was a very easy way to motorize non motorized set, or MOCs. It's a good place to put the battery box and have the 12v/9v motor locate. The lone tender, all by itself, is a bit weird, but it was part of the set. You could have a tank engine by itself (small or large), or ... you could buy a tender and make it into a tender engine (small or large). I loved this range. I have a small grey tank engine, a small blue tender engine, and large black and green tender engines ... but I feel like it's not enough, I want every colour and combination, heh. The only ones I never wanted were brown. I just never liked brown as a colour, as industrially-realistic as it would be for a train. Great theme! I love Lego trains! @ SeekerBear: I know how the theme works and I think it's very clever. Those were the time's lego made it possible you could pick your own train together at stores. You could choose out of 4 locomotive's and 5 colours. A small locomotive, a small locomotive with tender, a large locomotive or a large locomotive with tender. 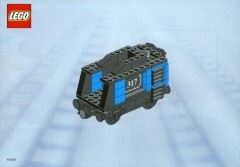 You had the colour pack with all bricks for a locomotive, and you choose the basic kit for your small or large locomotive and if you choose a locomotive with tender, THIS was the set with the base ellements for that. Than you could choose to electrify it with a 9v engine, or not. And you could ad an electric light to the top to. And put it on tracks of your large set, or buy loose tracks with it. It was really a great idea to make a train how you wanted it, getting started at the base, and adding to it to make it fully functioning. I started with trains this way with a green large locomotive. Saved money every time till I got 4 colours and 4 different locomotives. And years later made the fifth colour. It was a really good way to get kids into lego trains inexpensively, instead of the very expensive large sets these days. I had this when I was younger (4-5) and I loved it, it went with the locomotive wonderfully, and with a couple black bricks could be modified to actually carry a load of coal. Looking back on it, yes, it was a get money plan for LEGO, but what isn’t? They’re a company that makes a product, to sell, and make money. @af.riem: In theory, yeah, this would have been a great, inexpensive way to get kids into LEGO trains. In practice, though, individual train cars have never sold as well as full size trains do, which is probably part of why LEGO went ahead and repackaged the "My Own Train" locomotives and cars as full train sets in 2002. And on some levels, I think this is to be expected — same as why LEGO doesn't sell the modular buildings as individual floors. People buying a particular type of set for the first time are far less likely to become passionate collectors if their first few purchases fail to deliver a complete or satisfying play experience or display presence. And when it comes to LEGO train sets, modular buildings, etc, the whole is considerably greater than the sum of its parts. Also, if we're being perfectly honest, the value proposition for the My Own Train theme in particular was not really great to begin with. While price per piece may not be a perfect metric, note that this set in particular cost $11 for just 39 pieces — none of which were the kind of particularly expensive parts like motors and tracks that one might ordinarily associate with train sets' high price per piece. The Large Locomotive and Small Locomotive sets were likewise both over 20 cents per piece. Assembling a My Own Train layout equivalent to last year's Passenger Train set — a 4-axle locomotive, two passenger cars, a 20-piece loop of track, and the electrical components to make it run — would have cost around $166 back in 2002, or the equivalent of around $232 today. Making one equivalent to last year's Cargo Train set — a 4-axle locomotive, three freight cars, 16 straight rails, 16 curved rails, a switch, and the electrical components to make it run — would've cost around $210 back in 2002, or the equivalent of about $295 today. And that's all without additional contents from the modern sets like minifigs, trackside structures, transport trucks, or forklifts, by the way! While it be true that average families in the early 2000s had more disposable income than today, and that sets having less value for money than today was the norm back then, I can't imagine that buyers would have been all that enthusiastic about being nickel-and-dimed like that just to get a motorized train layout that meets the minimum standards of playability! A shame these (from what I've heard) didn't do well. Its nice being able to get all the parts you need to make a small model without buying a whole 'nother super expensive set. I was never really into trains, but if they started releasing a few spare cars a might get more into them. When I was a KFOL (1970s), saving up $11 was an attainable goal compared to saving up $100 for an entire train, so sets like this were AWESOME!!! No need to go completely without buying anything for several months when you can get a locomotive one month and buy the next car a month later. For the naysayers, why not just have a single "Star Wars 2018" set that covers all the releases instead of breaking it down into smaller sets? I'd rather get smaller sets for a little more money then relying on the big-sets. If you have no train set at all, the big set is a good deal, including track and motor, however it's not nice to expand existing trains with. They still sell rails and motors seperately. Huge playsets like Assault on Hoth, or Capital City or whatever might make great (but expensive) , all-in-1 playsets for kids , however AFOL look at seperate builds more critical and I certainly am not interested in each little build 100% of the time. @datsunrobbie: I don’t think you truly recognize what the pricing structure of this theme was like. This $11 set didn’t even contain all the parts you needed to build a tender — rather, it contained only the black/grey bricks, with everything else sold as separate $7 color packs. The locomotives were the same way. To use your Star Wars example, it’d be like if LEGO Star Wars made you buy three separate kits to build a Jedi Starfighter — one with the grey/white bricks for the wings, one with they grey/white bricks for the cockpit, and one with the bricks for each individual Jedi Starfighter’s colored markings. Oh, and none of those three include any minifigs or droids — you have to buy those as a separate set too. By the time you have a complete ship with pilot and droid you’ll have paid way more than for a complete Jedi Starfighter set. I think it has to be understood that trains are a lot like pirate ships, castles, or police stations in that they are inevitably going to cost a lot for the sort of play experience that most buyers are looking for. Breaking them up into smaller sets that are boring on their own doesn’t make them any better a value for buyers than buying a castle set one wall or tower at a time for a higher price than you’d have paid for them as a bundle. @TeriXeri: If you’d be OK paying a higher price per piece for only certain parts of a set, why not just buy it from BrickLink sellers or other aftermarket sellers who have parted it out? It’s the same result, without LEGO needing to risk losing money on individual train car sets that have never sold as reliably as full trains. I know for a fact that a lot of AFOLs already take this approach with Star Wars, Super Heroes, Ninjago, and Elves sets when they only want some of the builds from any given set and not others. And plenty of resellers are happy for any opportunity to boost their profits by breaking their bigger sets up into separate lots that they can sell for a total price well over the original RRP. @Aanchir I agree with you, that having to start with modular sets is a bad idea, but for me expansion sets seem to be a nice idea, kinda like Playmobile does with their d2c sets containing wall parts for their castles and figures and so. Ah yes, but is it legal tender? I don't know how to feel about the idea that these sets weren't very popular, at the time they were being sold. Usually when sets aren't popular, they go for practically nothing on the resale market (because the demand just isn't there). I picked up the entire World Racers line recently, for peanuts, same with the original line of Alpha Team sets. So if Train sets are so unpopular and unwanted, at the point of sale, why are they so freaking expensive on the resale market? To pick up a simple MOT tank engine, it's easily over a hundred bucks. The tender engines are twice that.